A Thank You Plaque was given to the leader firm in the dry food sector Reis Gıda from the Economy Journalists Association (EGD). The traditional Bayramoglu meeting of EGD was carried out on 13th and 14th of September at Press Release Institution Press Holiday Village. In the organization joined by EGD President Celal Toprak and economy reporters, there were also representatives of the business world as the Reis Gıda Chairman of Board Mehmet Reis, Metro Wholesaler Market Turkey General Manager Kubilay Ozerkan and Trakya Et-Süt Ürünleri AŞ General Manager Andac Gunsoy. 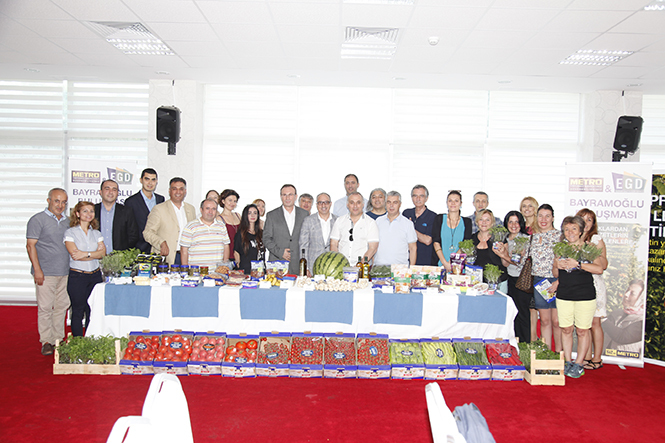 Metro Wholesaler Market Turkey General Manager Kubilay Ozerkan informed on the geography markes products’ increase in the market. Reis Gıda Chairman of Board Mehmet Reis who reminded the collaboration of Reis Gıda and Metro Wholesales Market for protecting the Taskoru Garlic, recorded that they will be starting the world tour by exporting the Taskopru Garlic marked as geographic produced with domestic seed. The most intense garlic harvesting in Turkey is done at Taskopru. The thing that makes the garlic of Taskopru so irreplaceable is the high level of iron and sulphur rate, strong taste and smell. This garlic type is rich in mineral (especially selenium) and vitamin and is both tasty and healthy. The Taskopru garlic which is only grown in this region’s climatic conditions, is known as the best garlic around the world.